It’s no secret that Bugatti is planning to launch a second model to sit alongside the Chiron hypercar. Recently, a report claimed that Bugatti’s next model will be a revival of the Royale as an ultra-luxury, fully electric limousine. Now, Car Magazine reports that Bugatti is also considering developing a two-door "crossover-influenced sports car.” The company has reportedly finalized proposals for its second model and is awaiting approval from Volkswagen Group, which will ultimately decide what form it will take. While CEO Stephen Winkelmann has asserted that Bugatti will never make an SUV, this doesn’t rule out a high-riding crossover with a lower and less boxy shape than a traditional SUV. It would also make sense given that Winkelmann oversaw the development of the Urus, which has been a huge hit for Lamborghini. Bugatti’s high-performance crossover would be more compact and lighter than the Urus, which tips the scales at 4,850 pounds. The publication claims Bugatti’s sporty crossover will share the same 641-hp, twin-turbo 4.0-liter V8 as the Urus, but some additional electrical assistance will bring the output close to 1,000 horsepower. That’s 359 hp more than the Urus and significantly more power than the upcoming 670-hp Porsche Cayenne Turbo S E-Hybrid. 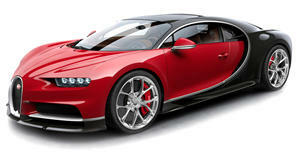 Bugatti’s boss has said the company would have to upgrade the Molsheim factory to make room for the taller model, but Car claims Bugatti might "need to tap the group’s factory network to assemble the model.” A Bugatti crossover would also ride on a unique platform, rather than utilize an existing Volkswagen Group architecture. If it gets the green light, Bugatti’s two-door performance crossover will go into production in 2023, with 800 examples produced each year. In contrast, the Chiron's entire production run is capped at 500 cars.